Dan at work. Roche Pharmaceuticals Headquarters, Basel, Switzerland. As the visionary leader of one of the largest pharmaceutical companies in the world, Daniel O’Day is changing the future of patient care. At a time in our country when healthcare is a polarizing topic, everyone can agree with Daniel O’Day. 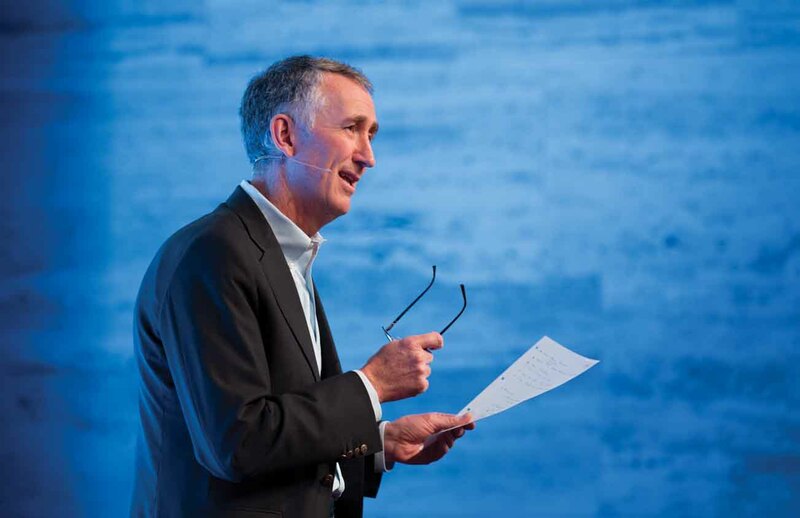 His mission to cut the time between discovering life-changing medicines and getting those medicines to patients is central to his role as CEO of Roche Pharmaceuticals. Roche has a unique innovation model – bringing together the latest advances in diagnostic technology with the development of breakthrough medicines, all within the universe of “Big Data” and advanced analytics. Roche innovations have already made the company a global leader in treatments for cancer and other diseases, and there’s much more to come. “We took a leadership role in personalized healthcare. I believe we have a unique strategy in that we have both pharmaceuticals and diagnostics divisions within one company, working together to optimize the outcome,” In other words: “It’s all about getting the right drug to the right patient, in the shortest amount of time possible,” I first met Dan over the phone when he spoke to me from Basel, Switzerland, Roche’s headquarters. Despite the distance, he has a gift for sharing stories and experiences that make you feel like he’s in the room. During our conversation, he spoke with energy and warmth across a range of topics, from speeding up clinical trials, to the need for diversity in the workplace, “not just because it’s right,” but because of the creativity and divergent thinking that people from different backgrounds bring to the table. Born in Texas, Dan and his four siblings formed a tight-knit unit. They had to, because the family moved every couple of years, wherever their father’s job with IBM took them. The constant uprooting was actually a gift for young Dan, making him very adaptable to change. Today, perpetual motion seems to be built into his very essence as he works to make things better and faster in drug development. Dan meeting patients at the Roche Childrens’ Center in India. O’Day has never moved outside of Roche though and has been with the company since 1987. 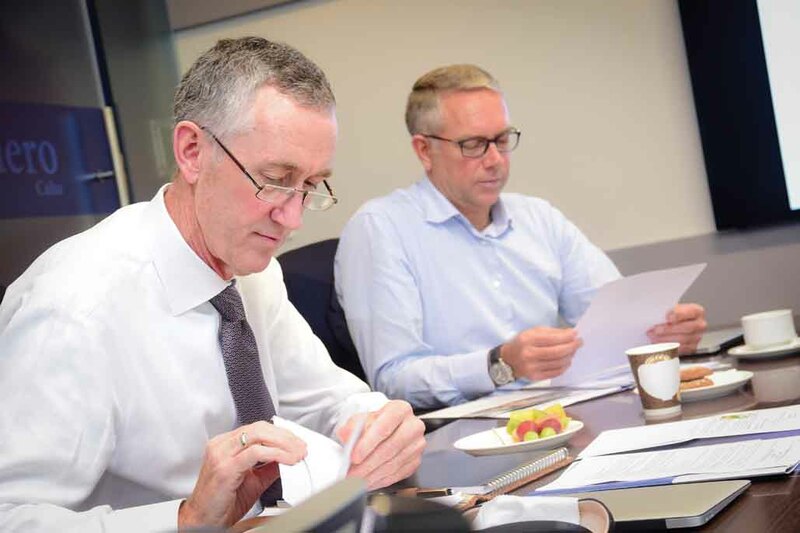 After joining right out of college, as part of Roche’s U.S. commercial team, O’Day has climbed up and up with leadership positions in various parts of the organization. His previous roles include head of corporate planning in Japan, general manager in Denmark, president of Roche Molecular Diagnostics in California, and CEO of Roche Diagnostics. He became CEO of Roche Pharmaceuticals in 2012. “It’s exciting to bring all these different disciplines in the company together with a common goal,” he says of the job. “I always wanted an international job,” says Dan, who’s one of the lucky few who found it in a field he was always drawn to – healthcare. While still in high school in Connecticut, he became an Emergency Medical Technician, working with patients in need of critical care. It was an experience that informed his life and his sense of purpose. He went on to do his undergraduate degree in biology at Georgetown University (his thesis was on the mating habits of the Mexican beetle! ), and considered going on to medical school, but ultimately decided on the healthcare industry, where he could put his education and empathy to work from the business side. While working at Roche, he also gained his Executive MBA from Columbia University. With big goals in mind and eager to cover new ground, O’Day remains on the move. “I look on my work as a journey. There is a lot of learning every day and that’s exciting.” For all of us. 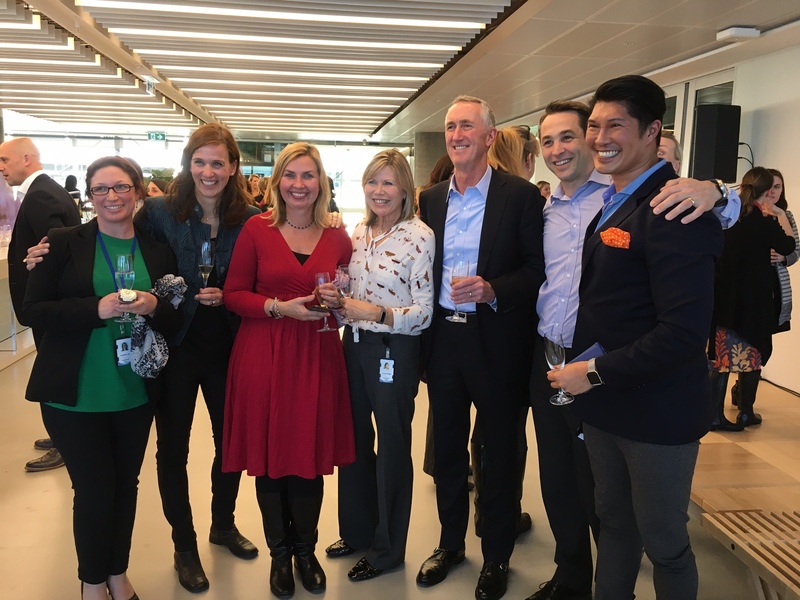 Dan pictured in Sydney with a group of employees from Roche Australia. What would you say was the culture of Roche that kept you there all this time? I think the most important, central theme is the focus on the patient. 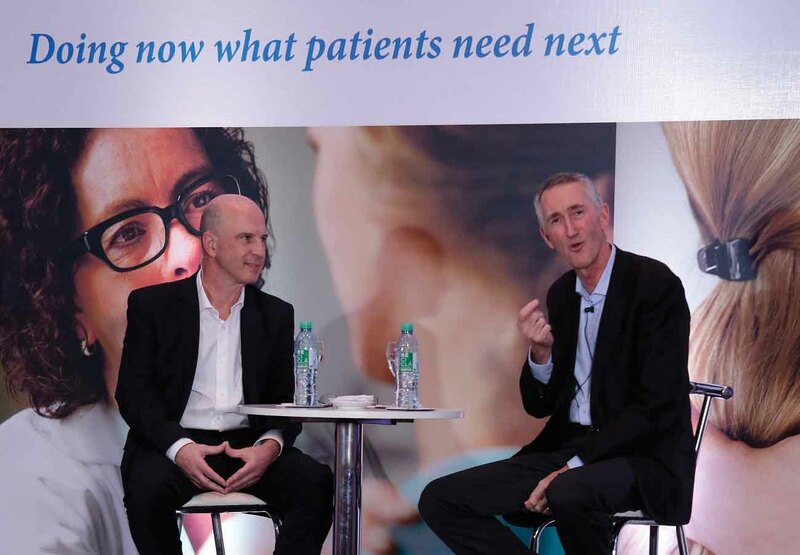 A lot of companies talk about this, but at Roche the patient focus underpins all our decisions. This way of thinking was instilled in me by my mentors in the organization and I pass it along to others: If you need to make a choice between something that is right for patients and something that seems better for the business, ALWAYS chose the option that is right for patients. It is something that is lived throughout the organization and emanates from the founding fathers of Roche. The other factor is that Roche is a very decentralized organization, with a lot of independent decision-making and creativity at the local level. That suits me very well and to some extent, it has made it feel like I was moving between lots of small companies, even though all the moves were within Roche. How did you end up at Roche? At the time, I applied to several pharmaceutical firms. Roche was one of the companies that offered me a position, and I had to decide which one I would accept. I remember asking my father, “Dad, which would you pick?” He said, “Well, who was the hiring manager that you think you could learn the most from, and would inspire you the most?” What he was saying was, “pick the right cultural fit,” so that is what I did and I was fortunate enough to be hired by Roche. My father influenced my choice of company and he has also inspired me in many other aspects of my life. He was very industrious and became the first member of his family to go to university, attending Gonzaga in Spokane. After completing his undergraduate studies, he went into a recruitment office and said, “I would like to get a job at IBM.” They said, “Well, we only hire people with master’s degrees.” My father who was very literal, went away and got his masters in mathematics from Washington State University. When he returned to the office two years later, the same people were there. They couldn’t believe that he’d actually gone off and done what they told him to do, so they gave him a job. That job turned into a thirty-five year career with IBM. Dan preparing for a meeting. Fifteen years ago, my father passed away from Lou Gehrig’s disease (also known as Amyotrophic Lateral Sclerosis). After influencing me so much throughout my life, my father continued to inspire me at the end, with the way he approached his illness. Rather than question “why me?” he accepted what had been dealt to him and persevered with great courage and dignity. This made a lasting impression on me. It is very difficult to see anybody that you care about go through this disease because their mind stays very alert, but the body gradually breaks down. The greater understanding of DNA and genetics has blown the doors open for our cancer research over the past ten to twenty years but there is still a long way to go in understanding neurological diseases. We are seeing some breakthroughs. We have just introduced a new medicine for multiple sclerosis, for example. It is based on a whole new mechanism of action and has shown terrific results in patients with both the relapsing and primary progressive forms of the disease. Other companies have also made incredible progress in MS in the past ten years but in diseases like Parkinson’s, Alzheimer’s and ALS, there is so much medical need and so little you can do. I am really hopeful that we will also start to see breakthroughs in these diseases in the next ten years. You have done a lot of moving around, first as a kid, and then within the company. Was that something you sought? We moved every three years when I was a kid, and both my wife and I have had a strong interest in living in different countries to learn about other cultures. From a business standpoint, it has been really valuable to appreciate that diversity around the globe and why that is so important, to any innovation-based business. I spend a lot of time focused on how we might increase the diversity of people in the company and how to bring that mix together in a way that leads to something very innovative and powerful. I always wanted a global career. My ideal move within the company was one that gave me the experience of a new discipline and a new country. I looked on my career as a journey and I didn’t have any final destination in mind in terms of a specific role. What I did know is that I wanted to have an enterprise-level job and I thought the best way to do that was to try to get as many different experiences as I could. I find it very exciting to bring all the different disciplines in the company together – from development to manufacturing to marketing – with one common goal. “Give Back” volunteers. Employees are encouraged to take time from their busy schedules to give back to the community. Personalized medicine is a term we hear more often now. Can you talk about that? The personalized approach allows us to better understand who is likely to benefit from the medicine and who is not, while we are still at an early point in the development of a medicine. We want to do this in every field and we are doing it beyond cancer care, but oncology is an area where we have a really deep understanding of the science. We are able to target specific groups of patients that are likely to benefit from a particular medicine, based upon their genetic profile and with the use of sophisticated diagnostics. When you are able to identify those patients, you can do clinical trials much faster and with smaller patient populations. I am very passionate about reducing the cycle time from discovery of medicine to getting it into the hands of physicians and patients. We are making great progress. So, do you think this next state of personalized healthcare – or personalized healthcare 2.0 – is the way of the future? I am sure it is the future of healthcare. It’s a much more logical way of approaching diseases when you can get a very good, comprehensive diagnosis at the time of onset or preferably at the preventive stage, and then allocate the right resources specifically for that patient. We wouldn’t want our medicines to be used when someone is not benefiting. Every medicine has a side effect, and you are essentially adding cost to the healthcare system if somebody is taking your medicine but isn’t going to benefit. It will be an evolution, but I have to say, in cancer care in particular, I think we are going to see this approach used much more consistently in the next five years. More and more cancer medicines are being approved in countries around the world that are specific to a particular patient’s genomic profile. We need a critical mass of these medicines to ensure that we have enough personalized options to offer to patients. Eventually we will reach a tipping point and this is when personalized medicine will become routine rather than just for the more fortunate patients. We are getting to that point. 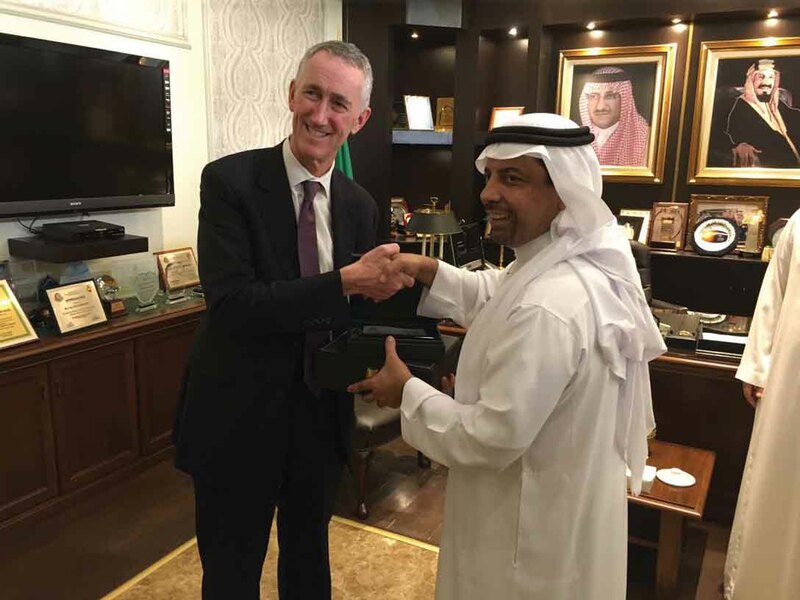 Meeting with Dr. Khaled Bakolka, Executive Director of the National Guard Hospital in Jeddah. Saudi Arabia. Can you explain the “big data” idea? The digital world is helping to take personalized medicine to a new level because of two things: the availability of big, robust data sets that track people over a long period of time, and the application of really advanced computer capabilities. Advanced analytics can interrogate the data to come up with ideas for new medicines, enable us to do clinical trials faster, and eventually to help the healthcare system determine who should be treated and who shouldn’t in a constrained economic environment. The discovery of medicines is all trial and error, at the end of the day. You have a hypothesis, you test it, you adapt it, and you keep trying. The better you can analyze the data, the more refined your hypotheses are going to be and the more likely you are to get things right first time or be able to adapt quickly. It has a huge effect on reducing the time of bringing transformational medicine to patients for diseases where there is significant need. We are really just at the beginning of exploring what big data can do for advancing medicine, but we know it will improve both the development of medicines and patient care. Taking part in an interactive event with Roche employees. Is this something Roche can do alone or do you need to bring in other companies to make progress? I think we took a leadership role with what I call “personalized healthcare 1.0,” which is a combination of diagnostics and a medicine. 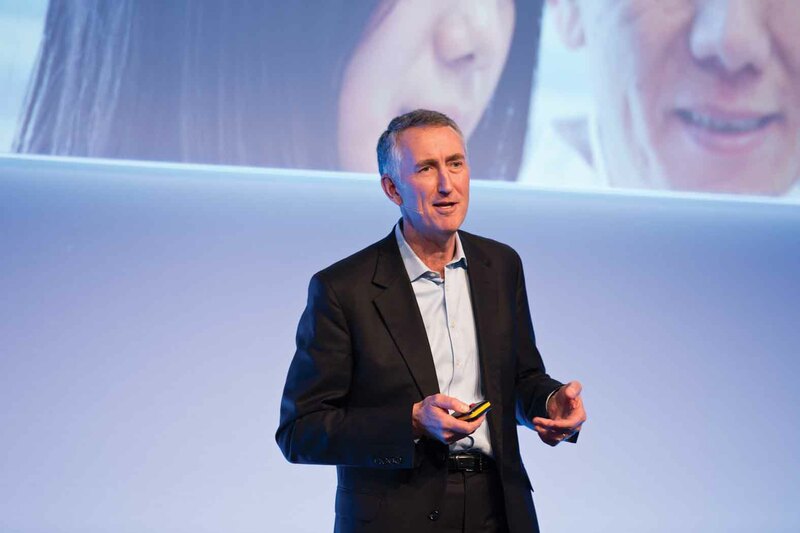 Within Roche, I have had the opportunity and pleasure of leading both the diagnostics and pharmaceuticals divisions, and our strategy has always been to have colleagues working together at the intersection of these two fields. Now we are evolving this to “personalized healthcare 2.0” with the use of advanced data and analytics. As part of that, we have added some external partners from the fields of data and analytics. One of these is Foundation Medicine in Boston, a company that performs deep analyzes of the genomic profiles of cancer patients and compares them with existing profiles in their database to generate valuable insights. We have another exciting collaboration with a company in New York called Flatiron Health. They have electronic medical records from around 1.5 million patients in the United States through their network of cancer treatment centers. Flatiron is able to curate reams of structured and unstructured information from those records, creating a very powerful database that shows how patients progress over time in the real-world setting. Even as a large company, we believe that the vast majority of innovation happens outside of our walls, so having these partnerships with entrepreneurial companies that are leaders in their fields is very important. It helps us to stay at the cutting edge of innovation and I find it extremely exciting. Dan is passionate about putting the needs of the patient first. What is key to your leadership success? It starts with hiring smart people. I think it’s key to surround yourself with people who are smart, confident, and can challenge you. My job as a leader is to provide feedback, to remove obstacles, to do everything possible to make that person and their mission successful. The more senior I’ve become in my career, the more opportunity I have had to cut through things that aren’t working well in the organization. My leadership style is getting clear on what success looks like and then spending my time going around, removing obstacles, coaching, providing feedback. This is something that has served me well. What do you look for then in a new hire? I look for people that have had diverse experiences and are passionate about looking at problems from a different angle. There are a lot of jobs that require very specific technical skills and some that are more general, so on the skill side, we look for people that are really thoughtful, very well educated and feel confident in their field of expertise, but then, on the experience side, I always look for folks that have a diverse mindset. It is really fundamental to my leadership style because I believe very much in spending a lot of time in the hiring process, getting that right, hiring the very best people you can with the criteria I described. 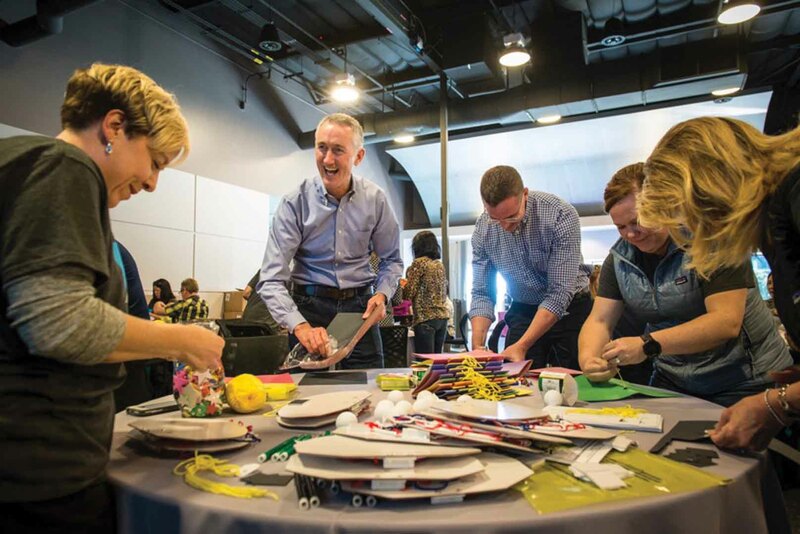 Dan visits Roche sites around the world to host interactive events with employees. Can you talk a little bit about your own wellness approach? I hear that you took part in an Ironman triathlon. Where you always athletic? In my university years, I was more into music than sports. I played trumpet at that time, but found it was difficult to keep up with the music during my professional life. I took up running as a way of maintaining my mental and physical stamina. I start most of my days with running or some type of exercise, and I find that my mind works really well for the rest of the day when I’ve done this. It enables me to stay physically fit, too, but I do it more for the mental benefit. I like to have a goal, so I started running races and got into marathons and then triathlons. I like nothing more than to go out for a two-hour run and just have my thoughts to myself, whether that is working through a problem or switching off for a while. Eventually I started doing Ironman triathlons and am happy to say I completed five so far, as well as some half-Ironman competitions. I enjoy the lifestyle that goes along with triathlons and I like the people that do them. I don’t approach them in a very competitive way. It’s more about having a goal and pushing myself to achieve it. Was your Irish heritage important in your family? Yes, very much so. The perseverance of my Irish ancestors is a daily motivation to me professionally and personally. My dad made a point of making sure we went back to Ireland, and traced our roots to Ennis, County Clare. He brought the whole family back at different intervals in our lives. I have been very touched by my visits back there. We don’t have a direct connection with relatives, but we have run into other O’Days doing their pilgrimage at the O’Dea Castle. My great-grandfather, Richard O’Day, was born in 1853 in Berlin, Wisconsin, and he was first generation. If I understand the history right, he was working a bit on the railroads, and eventually my grandfather transitioned from the railroad to oil refinery work in Montana. My dad grew up in Cut Bank, Montana. There was still very much this spirit of perseverance and hard work in the family; there was a connection to our Irish heritage, and a sense of trying to establish yourself in a new country, as an Irish American. Clare is known for the quality of its traditional musicians. Was there music in the O’Day family? It is so interesting you say that about Clare, because the last time I was in Ennis, I was so inspired by all the musicians on the street. My grandmother played piano and my siblings and I were all exposed to music at a young age. I started with piano and then got into the trumpet, and it became a great passion of mine. I miss it actually. Maybe I can spend some of my retirement back in Clare, trying to earn a keep by playing trumpet on the street.